Prepare dressing: Puree raspberries in blender or food processor. Press puree through sieve to remove seeds, if desired. Whisk together puree and dressing ingredients. Set aside. Slice or tear radicchio and Bibb lettuce into bite-sized pieces. Soak radicchio in cold water 10 to 15 minutes; drain and pat dry. 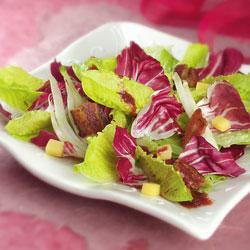 In large bowl, combine lettuces and remaining salad ingredients. Pour dressing over salad and toss. Variation: Omit turkey and pecans. Substitute 1 cup sliced or cubed smoked Gouda or smoked cheddar cheese and 4 slices (2 oz.) cooked, crumbled bacon.